Surely you've seen this clever analogy, above, float across your Facebook feed by now. So, in the interest of promoting useless personal information via social media and speaking of liking donuts (which I do, tremendously), I thought I'd share what my daughter and I found at a pastry shop in Seville, Spain: a donut cake and donut gelato. Really? I thought donuts were strictly an American fat-fried, sugar-coated, artery-clogging confection. I certainly knew there were more refined versions in Europe such as the Berliner (German), the Beignet (French), and the churro (Spain), but these American, glazed, dough-ring replicas really caught us by surprise! 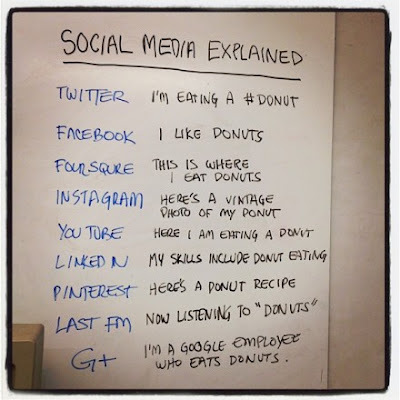 That Social Media donut explanation is funny and so true! Those donuts are surprising and look so delicious! I'm a little skeptical on the Donut Gelato but still sounds good. Did you taste it? That is so cool Sonja! I like donuts too, double chocolate ones, particularly when pregnant. I'm going to check out the gelato shops in Cairns next time we're down there and see if they have donut flavor. Sooooooo....how did it taste? You did taste it right? I guess donut gelato would be like cake batter ice cream- a little weird but it grows on you. Who knows. That is so funny-- those donuts! Apparently Sevilla loves Americanized donuts! While I do like donuts and their European counterparts (besides what you mentioned I would add the Romanian GOGOSHI :) ), I would not eat them in this "constellation": icecream or cake. :) But it's a funny idea! We have plenty of donut shops in Australia but I know of people going to the airpot just to buy the American donut Krispy Creme as the airport is one of the only places they are sold here.